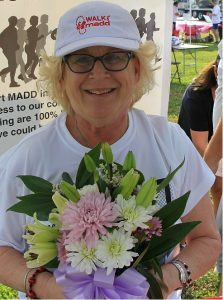 MADD would not be where it is today without the determination of our volunteers. It takes everyone to eliminate drunk and drugged driving. This month, we honor you, our amazing volunteers. We are kicking off National Volunteer Month by highlighting a special volunteer, Ms. Carol Levin. Carol lost her son, Todd, in 2006 to a drunk driving crash in Houston. Soon after, she began volunteering with MADD in every way possible. She has spoken at schools and Victim Impact Panels and participated in countless media interviews. With her help and team, Todd’s Troopers, she helped raise over $100,000 for MADD through Walk Like MADD®. Carol’s efforts do not go unnoticed; she was awarded the MADD Southeast Texas Planning for Our Future Award last June. She also strives to end drunk and drugged driving through legislative change as the chair of Government Affairs for the MADD Southeast Texas affiliate. She has traveled to Austin and Washington, D.C. to work to improve legislation and make it possible for us to one day live in a community with No More Victims®. Thank you, Carol, for your dedication to end drunk and drugged driving.